Mt Warning Climb. Climbing Mount Warning, Mount Warning National Park now Wollumbin National Park. The Big Climb - Mt Warning Summit Walk. (Wollumbin, Fighting Chief, Cloud catcher) is located in the Tweed Valley, 15 minutes drive from Murwillumbah and 64km from Byron Bay. ED Note: Friday 7 July, 2017. Please note that track reconstruction after severe storm damage in 2013 and again in 2017, has altered the route in places, so descriptions and conditions may have changed. See also Mt Warning Rescue Tales. 20/05/2003; Courtesy NSW NPWS - "Wollumbin is a sacred place of great significance to the people of the Bundjalung Nation. It is a traditional place of cultural law, initiation and spiritual education. Under Bundjalung law, only specifically chosen people are allowed to climb Wollumbin. Out of respect for their law and culture, the Bundjalung ask that you consider choosing not to climb." Read also The dispute over climbing Wollumbin-Mount Warning The Saturday Paper, Edition No. 163 July 1 – 7, 2017. Excerpt reprinted with publisher permission. Official height 1156 metres (3,793 ft), Summit elevation 1125 m.
Difficulty: Moderate to Hard/Advanced. Strenuous in places. Length: 8.8 kilometres (approx. 5.4 miles) round trip, unpaved and very steep in places. Duration: Allow 5 hours if you're moderately fit. There are no toilets on the track, and camping is not permitted at the summit or in the park. Toilets are located opposite the car park. Go before you go. This is a World Heritage listed national park. Please tread lightly and take out what you take in. by Stuart O'Neill, January 1999. Photo © Stuart O'Neill - Stuart's friend Andy, at the start of the climb. Stuart O'Neill is well known to the Big Volcano (and we expect to most people in these parts) as a dynamic and forthcoming person. He is the principal of Better Business Solutions, a marketing consultancy with a difference. Adventurous is another word that springs to mind when one thinks of Stuart. In fact we heard last week that he was going to make his first parachute jump (in tandem), in a business suit, and would be composing an advertisment on the way down! We haven't heard yet whether he made the sort of impact that he had in mind. Until a few months ago, he and his partner, Melanie, managed Pottsville Beach Motel catering especially to families and others interested in recreation at the beach. They and their family are now ensconced in their renovated, elevated Queenslander at Tumbulgum. Stuart has been to the top of Mt Warning seven times previously and his enthusiasm continues to wax lyric. Judging from the way his friend, Andy, is leaning in this photo (above), the climb is pretty steep! Anyway, here is the story of Stuart's climb in 1999. It's on at last! My wife, Melanie, has been trying for 2 years to arrange for someone to look after our 2 boys who are both under 4, while we climb it. Getting a baby sitter to start at 5 am is no sure thing. Finally my father who is visiting from interstate, assumed the role of nappy changer. 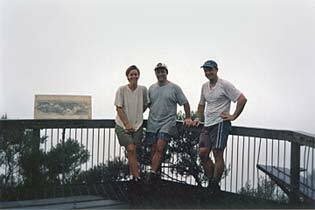 The three of us, including a long time friend from Melbourne, have agreed that tomorrow, the 4th of January 1999, will be the day that we scale the spectacular Mt Warning. 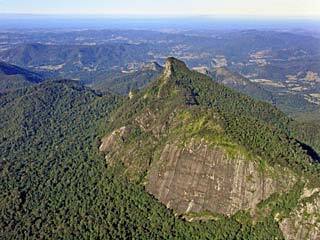 Mt Warning, Wollumbin*, the cloud catcher, is the basalt plug of the world's largest and oldest extinct volcano. We have been sitting around for days on end, hoping for a break in the weather. We've become so impatient that we are almost prepared to climb the mountain in the rain. Hopping into bed the night before a climb is quite exciting... knowing that finally the weather is looking good, and if all is fine in the morning, Mt Warning will feel my footsteps and the rainforest and its teeming wildlife will see me for the 8th time! One of Australia's earliest and most famous explorers, Captain James Cook, named this magnificent land mark Mt Warning in respect of the dangerous shoals he encountered off shore. 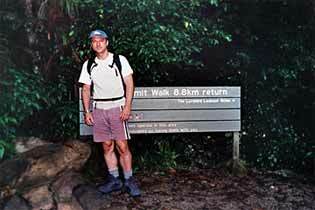 Mt Warning is, in my opinion, one of Australia's best climbs and walks. If fine weather prevails, it rewards its lucky climbers with unquestionably Australia's best views. Photo © Mt Warning looking east, by David Palmer. In the distance to the north you can make out the skyline of the urban, electric Gold Coast, and to the south, Australia's most easterly point, Byron Bay. To the east is the great South Pacific Ocean and to the west, the green mantle of the rainforest. The viewing platform provides 360 degree views and takes in some truly spectacular land marks. The unfortunates who have never made the heart pumping hike to the top think I'm crazy for having climbed this awe inspiring piece of history so many times. What they don't know is that this mystical mountain has strong connections with the inner psyche and incredible powers that seem unexplainable. Take the name 'Cloud Catcher'. One might think that Wollumbin got its name due to it's sheer height alone. On just about any given day in our lush tropical and sunny region, even if there are no other clouds in the sky, you will find a smattering of clouds hovering directly above the massive core of Mt Warning. When my batteries really need a recharge, there is no greater source of power to be tapped into than making the arduous trek to the summit. I've never felt more alive than when I'm sitting perched on the very peak of the mountain, over 1000 metres above sea level and I feel the warmth of the sun on my face, before any one at any other place in Australia. Due to it's height and position on the east coast, Mt Warning catches the first rays of Australia's morning sun. It's Monday the 4th January 1999, 5.30 am. I awake to the sun streaming in through my bedroom window. My feet hit the floorboards with a feeling of excitement. Today is definitely going to be the day! I quietly wander outside and take a better look at the weather. My 80 foot verandah which over looks the Tweed River at Tumbulgum in the far north of NSW gives me the opportunity to see all of the morning sky. We were hoping to be up early enough to catch first light at the top of the mountain, but to do this would mean a climb in the dark starting at 3 am. To the inexperienced bushwalker I would strongly recommend not attempting this on your first climb. In any case, only attempt to climb the mountain in the dark if you have adequate flashlights and spare batteries as well as a couple of buddies. Andy and Melanie are soon up and we sip fresh coffee on the verandah and down a substantial breakfast. Then we finalise the preparation of our gear and supplies. To go unprepared is like swimming against the tide. It can be done but not by non swimmers. If you have any medical illnesses such as heart problems, back problems or are just plain unfit I would suggest you consult your doctor before setting out. This climb, after all is over 1000 meters (3,280 feet) and very steep! Water, water and water. I would not consider taking any less than 2 litres unless you have good rationing skills (willpower) and you enjoy being hot and thirsty. After heavy rains you can come across fresh mountain water but don't count on it. Carry a day pack on your back for water, camera and film and maybe lightweight binoculars. A hat, sun screen lotion, and some fresh fruit or something else light to eat are essential. Depending on your experience with bush walking and your capacity to carry weight over a long distance I would travel as lightly as possible. Wear strong, comfortable, lightweight shoes such as bushwalking shoes, cross trainers (not tennis shoes) or walking boots. Blunnies (Blundstones), Australia's legendary work boots are fine. Loose clothing is a must and depending on the weather a light raincoat. Please remember there are no bins on the way up or at the top so what you take in with you MUST come back. It amazes me each time I climb, the number of people who attempt to climb the mountain un prepared. They start out in dress shoes, thongs, or flimsy sandals and wearing heavy clothing like jeans. If you cannot start the climb by lunchtime give the hike a miss. Due to the density of the rainforest it gets very dark very early. Our local rescue teams do not delight in saving ignorant unprepared mountain climbers who set off at 3 pm with no flashlights, no water and inadequate experience in the bush. The walk is 8.8 kilometers (5.5 miles) and you have to allow 4 to 5 hours for the round trip. Being halfway down, surrounded by dense rainforest with no food, no water and no light is not much fun, especially if it starts raining as well. The short scenic drive from Tumbulgum follows the Tweed River with Mt Warning in full view most of the way. Today, I assure my fellow climbers, is going to be a special day and will be a lifetime memory. We see clouds elsewhere in the sky, but Mt Warning is glowing with the full sun beaming down on this magnificent land mass. The turn-off from the main road takes us across 2 small bridges. Here we see the flotsam of recent flooding 8 feet up the banks of the Tweed River. When it rains in the Tweed it really rains! Mt Warning Road winds it's way up through World Heritage listed rainforest to the carpark. The air is much cooler when we hop from the car and the scent of moist rainforest hangs in the air like perfume. Mandatory photos are taken standing in front of the 8.8km sign. A full roll of 36 exposures is highly recommended, preferably 200 ISO or higher. We all go through our own stretching routines to help prepare us for a full on attack of our leg muscles. Staring up the stairway to torture, Mel and Andy are immediately appraised of what lies ahead. After climbing the first 100 steps, or so, the expletives are beginning to surface. I am also in pain, but choose to smile and keep on climbing... knowing full well that the real pain is only just beginning. Another couple of hundred steps later and we're all in full sweat with our hearts and lungs working over time. The first stage of the summit trail is the ultimate litmus test. Beat the stairs and you'll most likely conquer the mountain. The last 2 racks of stairs appear endless; your feet feel like they're going explode and your leg muscles are rapidly turning to jelly. If your muscles could talk, they would be screaming abuse at you. After more than 1000 steps, or the equivalent of climbing a 30 storey building, with no hand rails to help, we stop for a much needed rest. We agree that we know we're well and truly alive. The conversation, centred on self pity, is punctuated by the gulping of breaths and moaning and groaning. Less than halfway up Mel and Andy are buggered and need to stop for a rest. There is no point racing up this part as you will get there eventually if you take it easy. By the time we near the top, our legs are at melting point. We stop to check our heart rates and confirm what we are feeling: 130 beats per minute. Soon after starting again, four people on their way down pass us and offer encouragement, saying that the top is only minutes away. Soon I hear a scream from Mel and realise that she is at the top! She is very pleased with herself, and I'm proud of her efforts and persistence. There are already three people at the top, all sitting around soaking up the power and energy of this fine mountain. They applaud our arrival! We are surrounded by clouds. The place is totally socked in, but the achievement nonetheless feels great. The serenity, the silence, in being surrounded by clouds so high above sea level, makes it a special experience. Several more climbers stagger up over the top and are greeted with applause, as we were. There is a feeling of unity that each person shares with others that have conquered this almighty land mass. The sun attempts to break through the clouds several times but has no luck. We rest for about 30 minutes and eat our juicy apples before filling up with water and farewelling the group and heading back down. The climb and walk back down is much easier but still requires plenty of concentration. While climbing backwards down the rocks and chain, Melanie stops to offer encouragement to a pair of ladies climbing up. A short chat reveals that it's mother and daughter and that the daughter had climbed the mountain 20 years earlier as a 4 year old. We are impressed by that fact that mum is now in her sixties and is about to reach the top. We laugh and chat on the walk down and are pleased to be doing the mountain much easier. We pass at least 20 more people making their way up and offer our encouragement. Soon we are down the first of the steps and enjoying an easy walk down to the carpark. Plonking our weary legs and bums on the seats in the car is a feeling of total luxury. The feeling of self satisfaction is like a warm bath. Bliss! Please don't be one of these. 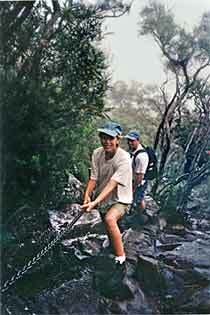 The Big Climb - Mount Warning Summit Walk, by Stuart O'Neill, January 1999. Photos by Stuart O'Neill. Photo: Aerial View looking east © by David Palmer for Big Volcano Tourism. The dispute over climbing Wollumbin-Mount Warning (link to full article) The Saturday Paper, Edition No. 163 July 1 – 7, 2017. Excerpt below reprinted with the publisher's permission. “"We are in danger of losing some of those rare species of plants that grow only on the summit because people want to get to the top to see what is on the other side." "Yes, they [Elders] would like to see less people climbing it." ... But, [Rob Appo] claims, they know they can't stop the primal human urge to climb a mountain. They just ask that it be done with respect and understanding.